Recently, many of you gave me your feedback about color choices for the wedding. The overwhelming majority of readers voted for pink and blue. I have to admit that for this occasion, pink and blue was my favorite choice, too! Although I adore a pink and green combination, I recently used it for the minnies' First Communion celebration. We're already well on our way to creating the palette for this wedding color story. The color story for this special day includes Navy Blue, Matisse Blue, Hot Pink, and Silver. I've been a busy bee and have already booked so many vendors! 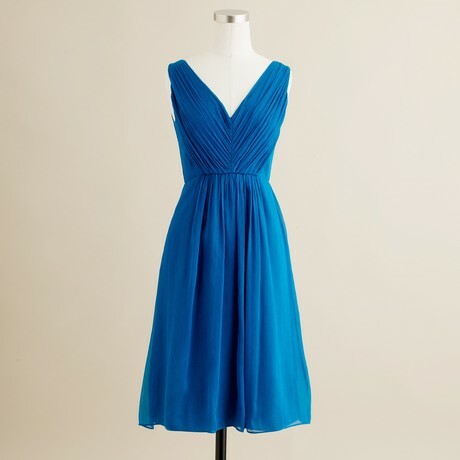 My two attendants are going to wear the Louisa dress from J. 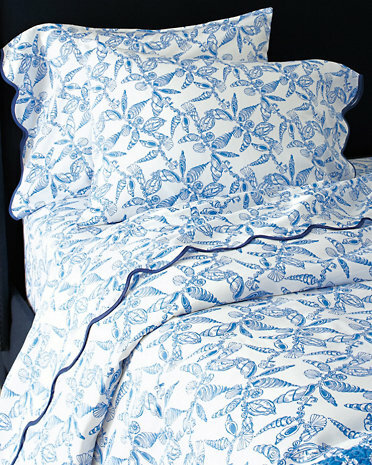 Crew in Matisse Blue silk chiffon. The plan is to pair the dress with silver shoes and jewelry. Who needs to rent linens when you can make beautiful table toppers at home? Lilly Pulitzer Fallin in Love comforter covers from Garnet Hill will be transformed into beautiful table toppers, piped with bright pink trim by my mother and her fabulous sewing skills. Peonies are in bloom in June. The large, fragrant buds are dramatic and colorful as a bright contrast to the shades of blue. 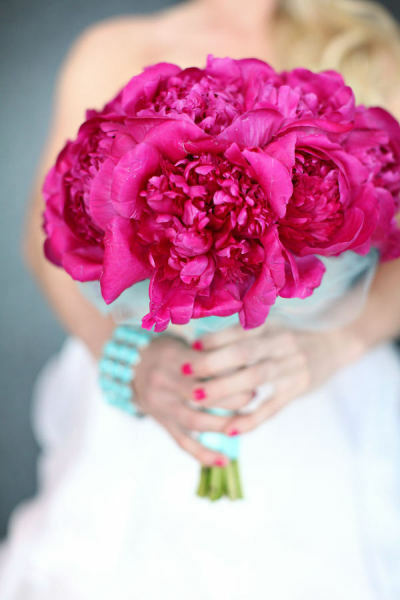 I love the idea of a large bouquet of peonies without any filler! Nautical touches and details will round out the color story while a candy buffet delights the sweet tooth of guests of all ages. More details to follow! So now it's your turn. I want my guests to feel special and I want to give them a favor that they'll enjoy. If it is a non-edible favor, I would like it to be something that they would actually keep and not leave behind as is often the case that I've seen at many other weddings. I'd love to hear your opinion about a question that is on my mind. If we're having a candy buffet, is another favor necessary? Leave a comment and let me know what you think. I would say the candy buffet is enough, however I do love seeing personalized favors. Recently, I saw a couple who gave small jars of homemade jam from an old family recipe as favors. Another favorite is making CDs for guests with your reception songs, after all who doesn't love music? I do not think a favor is necessary if you are having a candy buffet. The candy is the favor! That said, for our wedding in 2008 I worked with Le Bleu Water and purchased personalized bottles of water. I sent them a pdf of our invitation and they designed a label in our wedding colors that said our names and our wedding date and used the design from our invitation (our invitation was letter press and embellished around the edges). The labels were waterproof and did not slide off the bottles like the ones I have done myself in the past. Our reception site put out large galvanized tubs of the water bottles toward the end of the evening and people grabbed them as they went out. I paid $1/bottle and that included delivery. It was a simple and appreciated favor, many of my guests complimented the idea later. Also, many guests who have had a glass of wine or two ask the reception site for a bottle of water to go. Our site charged per bottle and it was actually much cheaper to have the Le Bleu bottles out for them to take! I was also married in June - peonies are my favorite flower! Also, favors are not necessary with the candy buffet. The past two years have been nonstop weddings for me and no favors were given at the weddings with the candy bars. Hope this helps! I always tell women to not spend money on a favor. The candy will be plenty and fun. Most people really do not care that much about favors. I honestly can only tell you one or two from the last two decades of weddings I've attended. Spend that budget elsewhere. Like on a great photographer or a fun band.